Click here for our large line of quality flavor oils! Clear, colorless and natural coconut oil-based sweetener. Very sweet! Only a few drops are needed per balm pot-includes stevia. Menthol Crystals are clear, colorless, needle-like crystals with a characteristic scent of menthol. Soluble in oil and alcohol. Usage rate: Up to 1%. Very powerful to melt with your oil bases. Only a pinch is needed. Article. All natural for making flavored lip balms, solid perfumes, and healing salves. Just melt and pour! Contains SoyWax�, Sweet Almond Oil and Candelilla wax. Enough melt and pour base to make over sixteen tubes or pots of balm. Mabel's All Purpose Natural Wax Jelly All natural for making flavored lip balms, solid perfumes, and healing salves, Just melt and pour! Jelly makes lips "supple" with Candellia Wax. We apply it first and then a protective balm like above for harsh weather. 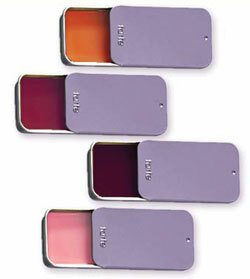 Enough melt and pour jelly base to make sixteen .04 ounce pots or tubes! Packaged in a Microwavable 4 Ounce Pouch. Mabel's All Purpose Balm & Chap Stick Base All natural for making flavored chap stick, solid perfumes, and healing salves, Just melt and pour! Contains SoyWax�, sweet almond oil and Candelilla Wax. To make lip balm just add a little more oil. 1 Pound Makes over 60++ pots of balm or chap stick tubes. Enough melt and pour base to make over one sixty tubes or pots of balm! Packaged in a Microwavable 2 Pound Container. 1 Pound Makes over 60++ 1/4 ounce pots of jelly.. Enough melt and pour base to make over one sixty pots of jelly! Packaged in a Microwavable 1 Pound Bag. Mabel's Lip Balm Factory All the supplies you need to make 20 white lip balm pots and 20 chap sticks. Just melt, mix and pour! Swirl in a touch of lipstick for tint. Click Photo to see larger size. VERY popular for birthday and slumber parties! 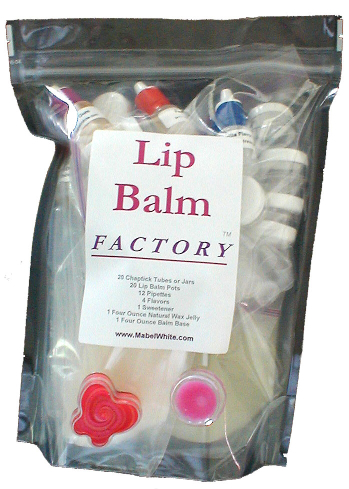 Contains 4 ounces of Mabel's All Purpose Balm Base, 4 ounces of Lip Jelly, 4 popular flavors, sweetener, transfer pipettes, cute containers and more! Easy to slip on and hit with blow dryer. Great to hold labels on also. It is hard to find small tins that actually open easy. These sure do! 1 1/4" inch round labels can work for these. New! English easy to open! Hard to find, but cute, 1/2 tins are great for balms and salves. Clear, Sweet, Edible and Great for Motion Lotion, Body Glitter and Breath Elixirs Too! Click Here for Flavors! It is used on it's own and not oil based! For more exotic oils click here! Click here for other body care making supplies!